Background: The Pax Romana (prosperous years of the Roman Empire) did not end with Marcus Aurelius. After his death and the mysterious death of his son and successor a new leader has come into power. This new Emperor is a military genius, and has been pushing back the Germanic tribes and the Persians, expanding the Empire. He has found that while the current armour, lorica segmentata, has served the Empire well, these new battles have revealed some short-comings and so the Emperor has called for new armour designs for the new legionaries. 1. Design armour for use by the Roman legionaries. 2. You aren't limited to just body armour, feel free to design the whole kit (shield, helmet, javelins, short sword, dagger, etc.). Last edited by Flip; October 6th, 2006 at 09:10 PM. Legionary commander Scipio Geta ascended the roman throne after a bloody military coup. Though he was a brilliant commander, he was insecure about being assassinated himself and overly anxious to secure the legacy and power of his bloodline. 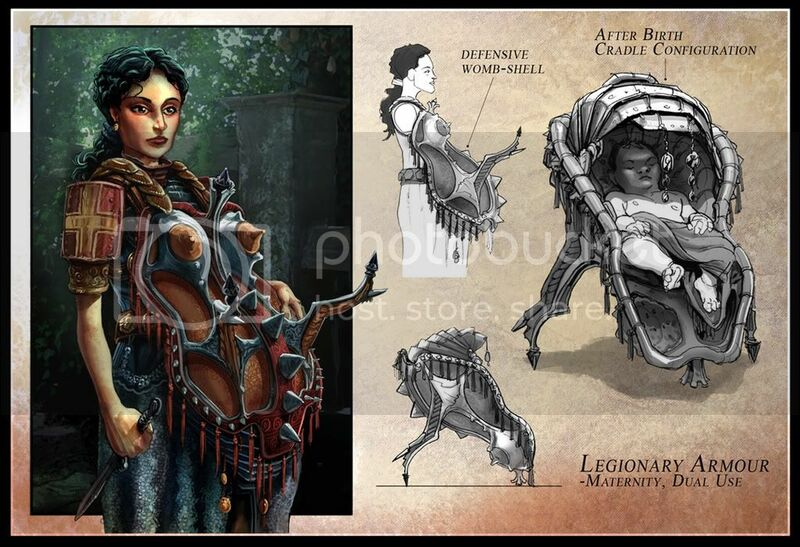 He eagerly went to work on creating an heir and had commissioned an armored shell to protect the future legionary during its most vulnerable gestation months. After birth, the shell was to serve as the child's first training throne. In actuality the armor was responsible for many a miscarriage and only a single daughter was able to live through its protection. Last edited by Chuck Wadey; October 7th, 2006 at 12:22 AM. In 193 Septimius Severus became Emperor with the help of Legio XIV Gemina the legion he once commanded. After disbanding the Praetorian Guard and replacing it with his own men from Legio XIV Gemina he decided to train an elite Legion which would serve as his personal bodyguard and as shock troops against the enemies of Rome. In order to inspire terror in his enemies he dedicated these troops to the Roman god Orcus, a god of the underworld, the punisher of broken oaths, an evil punishing god who torments evildoers in the afterlife. 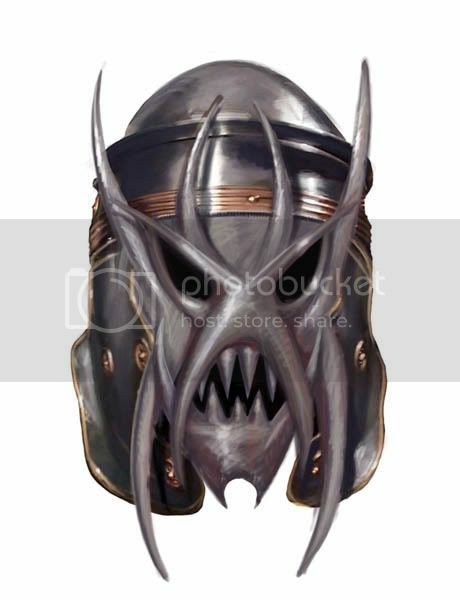 Using Orcus as his influence Septimius Serevus commissioned a unique armor design for these troops alone, the armor took on the visage and devices of the demon god Orcus. I'm just going to do the armour. I don't have time to do otherwise. Nothing crazy-new... Tried to do a relevant, functional revision. Hmm.. maybe a bit on the heavy side. Here's my WIP... wasn't sure if I'd have time to do this one, but I found myself sitting around drawing in between classes this afternoon..
Sogbad > the brief says 'design armour' so don't worry about it being just a helmet. cognition.sb, Sinix > great to see entries from you guys. I'm going to try to put up the new topic on Friday but this thread will be kept open until late Saturday, later if anyone needs it. Ahh, couldn't get it finished. Last edited by Flip; October 8th, 2006 at 01:59 AM. I love that dark metal, Sinix. he does look like he's about to fall to the left, however. Description: Most commonly found in the burial chambers accompanying high ranking Legionaires, these ornate sets of interwoven plates are woven and crafted with such fine skill that they are as visually stunning as they are formidable. 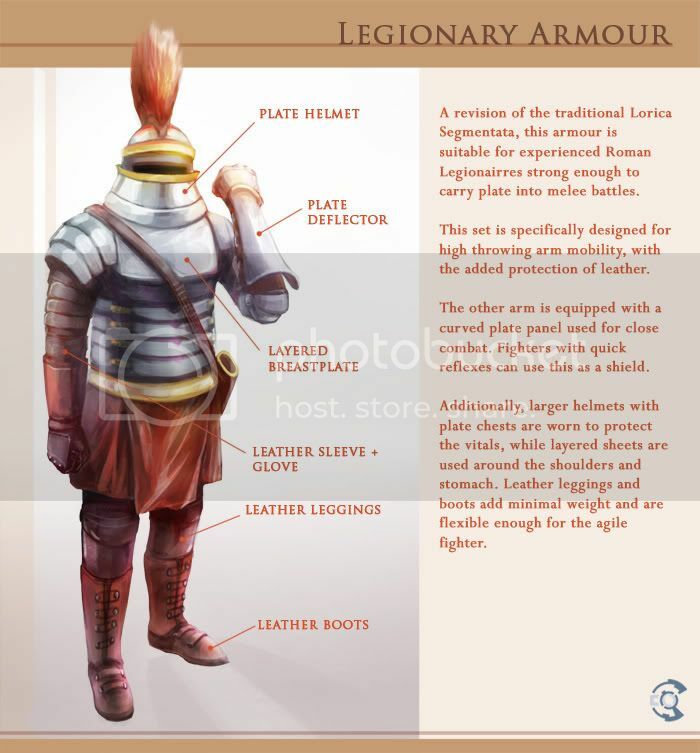 These sets are similar to the Lorica Segmentata armor preceding this generation of legionaires, save for a more striking visual appearance with more geometric and ornamented plates and a much more tightly knit and woven cuirass--finally with the addition of full arm protection. These suits found fewer blows reaching vitals and, more importantly, it noticably enhanced the morale on the battlefield. Last edited by Johnnyhorse; October 7th, 2006 at 02:28 AM. Ah, very inventive Chuck! Couldn't see that coming from a mile away. The crib is really cool. 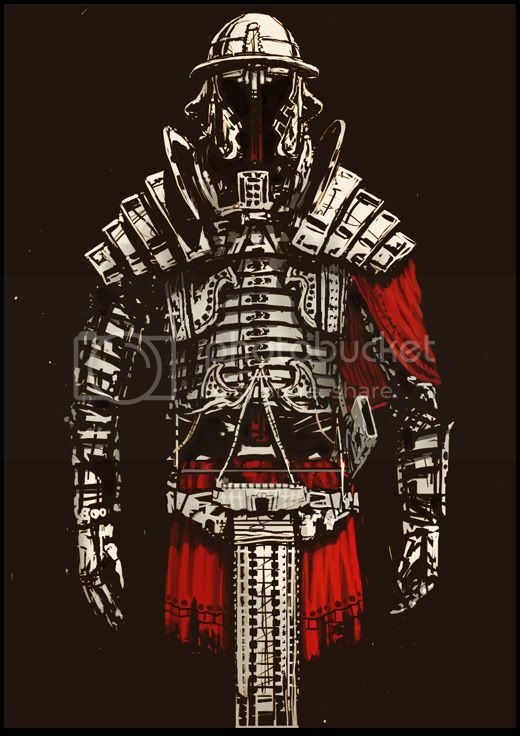 I'm glad to see you could implement the scale/plates into your design seen so often in the Roman Legionary armor. The breasts on the woman do bother me though... they do not seem consistant, and their angle a little off, and the top (of the three) spikes seems to not be quite in perspective. Sorry, I can't believe I'm critting the almight Chuck Wadey , but you also might want to check out that hand, there's something definitely off there! Good luck all... I guess we still have another day-ish.